We’ve been hearing quite a lot about Samsung’s upcoming devices over the last couple of days. One of these has been the Galaxy S6 Edge Plus, that the Korean manufacturer is now expected to unveil later this year. The Galaxy S6 Edge Plus is expected to feature Qualcomm’s Snapdragon 808 and come with a larger screen size, varying from 5.4 to 5.7 inches. But that’s not the only Samsung device that’s in the news. 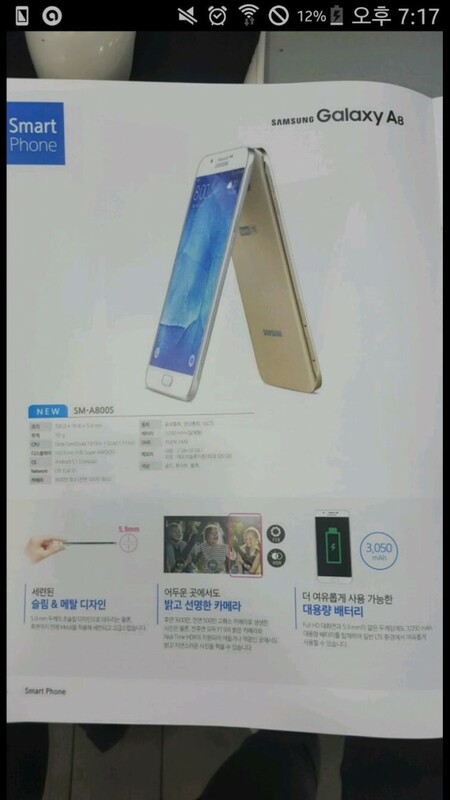 More word has started to surface about the Samsung Galaxy A8, the next in its A-series of mid-rangers. Samsung’s Galaxy A series have been symbolic for fans all around, as they were the first devices to see an all metal build. Well, the Galaxy A8 has not only been leaked through a video detailing its features, but has also seen its specifications leak, both of which you can see below. Looks like someone is eager to show off the Samsung Galaxy A8 in its full glory before the device’s launch. We’ve managed to get our hands on an hands on video of the device, coupled with what appears like a catalogue, both the courtesy of famous leaker, Steve of NWE. You can take a look at the video above and see the device in its full glory for yourself. Samsung’s latest mid ranger is expected to come with Quaclomm’s Snapdragon 615, coupled with 2GB of RAM and 16GB of internal storage. The image above manages to confirm what we’ve been expecting about the Galaxy A8 so far. Not only will the device be coming with a good, minimalistic design, but it’ll also be featuring a 3,050 mAh battery, with fingerprint recognition having made it on board as well. All of this is housed in a 5.9 mm thin metal frame, which should attract anyone whose willing to compromise on specs. Stay tuned, we’ll keep you updated.